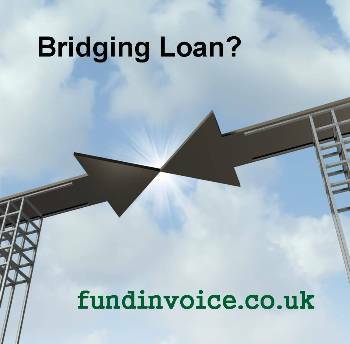 One of our panel of finance companies have just advised their new price for bridging loans. The bridging loan price is 0.91% per month, rolled up interest, with a set bullet payment at the end of the term of the loan. Bridging loans can be used to purchase commercial property in situations where rapidly agreed funding is necessary in order to make a purchase. Often, a mortgage application may be in process, which will be used to repay the bridging finance. The value of the loan can be between £25,000 and £20 million, with a term of up to 12 months. Limited companies, even start-ups can be eligible for this kind of finance, and even adverse credit history will be considered by this provider. Rolled up interest means that you do not pay the interest as it accrues, until you repay the principal value of the loan, at the end of the term. This means that you have no monthly repayments to make during the period of the loan. The interest is added to the principal sum of the loan, and this is repaid in full at the end of the term. It does mean that the interest payments will also increase of the principal sum due, hence future interest will be charged on the overall amount, although the nature of this type of bridging finance is that is only used for very short periods of time. The bullet payment at the end of the term means a lump sum repayment of the full value of the loan (including the interest that has accrued) which is due at maturity of the loan. If you would like more details please contact Sean on 03330 113622 or use our enquiry form for more details about bridging loans. More information about business loans.